Utterly enchanting Ethiopiques edition, starring the totally unique saxophone sound of Gétatchèw Mèkurya. 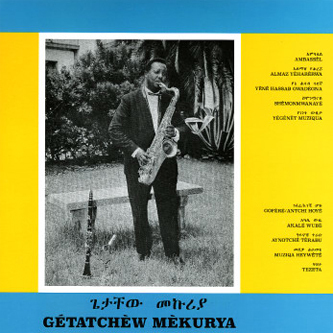 The label says "Gétatchèw Mèkurya is probably the most revered veteran of Ethiopian saxophone. A real giant, both physically and musically. Not only is he at the very top level of Ethiopian saxophonists, but he is the "inventor" of an extremely distinctive musical "style"." The album features ten of Gétatchèw Mèkurya's arrangements, blowing a snaking, smoky and hypnotic stream of notes over very minimal backing of shuffled percussion, keys and organ. I should admit, i'm adverse to the saxophone even at the best of times, but this one has genuinely caught us out and transported us to some exclusive club in Addis Ababa circa 1972, suited and booted, sipping cocktails and smoking the finest hash. A really recommended experience.